With its lights and sirens, Countryside’s Emergency Response Division is probably the division the public is most familiar with. The Division is responsible for “all hazards” response including fires and alarms, emergency medical incidents, hazardous materials, and water rescue as well as service calls like home lockouts and problems with smoke detectors. Countryside’s full-time personnel work a rotating schedule of 24 hours on duty/48 hours off, and part-time personnel supplement staffing by working 12-hour shifts. 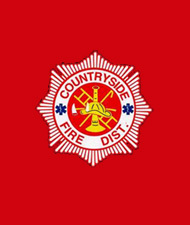 Daily shift staffing ranges from ten to fourteen fire personnel on duty at Countryside’s two stations, not counting the firemedics assigned to administration and fire prevention. All full-time personnel are certified to a minimum level of Firefighter II and are also licensed paramedics (Countryside has coined the term “firemedic” to describe that combination), though many hold more advanced certifications. 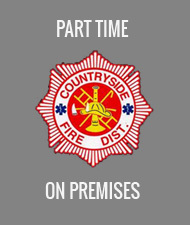 Part-time personnel are also trained to a minimum level of of Firefighter II, and those hired since 2004 are also required to maintain licensure at the emergency medical technician (EMT) level or above. Fire certification requirements are established by the Office of the State Fire Marshal. The progression of certifications is Firefighter 2, Firefighter 3, Fire Officer 1 (includes Fire Instructor 1), Fire Officer 2 (includes Fire Instructor 2), and Fire Officer 3. EMS licensure at the emergency medical technician or paramedic level is granted by the Illinois Department of Public Health, and Countryside’s EMS personnel are authorized to practice and provided medical direction through the Advocate Condell Medical Center EMS System. To better serve its customers and maintain shorter response times, the District believes in sending the closest available response units. To accomplish that, the District has automatic response agreements (ARAs) with neighboring departments to respond to various areas of the District. These include the Mundelein Fire Department, Libertyville Fire Department, Lincolnshire-Riverwoods Fire Protection District, and Lake Zurich Fire Rescue Department. In exchange for those ARA responses, Countryside responds to various calls within those departments’ jurisdictions. 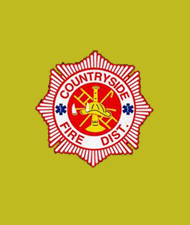 In addition to responding to emergencies within the District and ARA areas, Countryside also responds to mutual aid calls within the region as a member department of both the Lake & McHenry County Fire Departments Specialized Response Teams and Division 4 of the Mutual Aid Box Alarm System (MABAS). Countryside has also provided personnel and apparatus for Illinois task force responses to the Gulf Coast for Hurricanes Katrina, Rita, and Gustav.